Ever feel like your dog just doesn’t listen to the things you ask him to do? You’ve taken all of the classes and have learned everything there is to know about training a dog for real life, but it’s still a struggle to recall him in the park or get him to drop your $800 Prada shoes without a steeple-chase around the house. I think this is sometimes because we spend so much time focusing on what we don’t want our dogs to be doing, that we forget to ask for things that we do want them to do. There really are dogs out there who think that their names are “No!” Likewise, there are many dogs out there who think that choking on their flat collars while pulling like mack trucks is a perfectly normal part of going for a walk, simply because they’ve never known any different. The word “no” for us, has obvious negative connotations. It’s a quick word that flies out of our mouths any time we catch our dogs in the act. It comes to us faster than thinking up an actual cue, like “drop it” or “leave it.” “No” seems to be effective because we’re usually yelling when we say it, which startles and distracts our dogs. But does it teach them not to eat that delicious piece of garbage? Sure doesn’t, folks. It just teaches them that sometimes humans are loud and unpredictable, so it’s best to do things without them noticing. 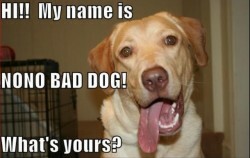 Which begs the question…do dogs feel guilt? I sometimes struggle with this one because their facial expressions sure do look guilty. But these appeasement gestures have less to do with guilt and more to do with trying to “turn off” the signals of anger/frustration that you are giving off because you’ve just walked into a room to find your couch stripped to the frame. My dog displays a guilty face when we say “what did you do?” even though she didn’t do anything at all. She just associates that phrase with when she has been “in trouble” in the past, and now my fiance likes to say it to her because her guilty face is really cute. He’s a work in progress. Some might think “oh gosh, these positive reinforcement trainers are so namby-pamby that they won’t even say ‘no!’ to their dogs!” It’s really not about that. We don’t believe that saying “no” is abusive or mean. We just think it’s a waste of breath. Dog training is about replacing behaviours we don’t like (i.e. stealing socks and undies) with behaviours that we do like (i.e. “leave it” or “drop it”). And of course, it’s about managing our dogs’ environments so that they’ll always be successful (i.e. put your socks and undies in the hamper, for the love of pete). The next time you catch yourself sounding like a broken record on the smash hit album “NO! And Other Dog Training Problems,” think about what’s happening in front of you and what can be done to change it, as well as improve communication between you and your dog. Just say NO to saying NO!